Sydney Russell Sixth form is a Sixth Form of Academic excellence. Teachers and students alike provide an environment of academic rigour that encourages outstanding results and excellent pathways to higher education and employment. 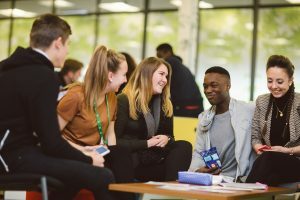 We consistently produce the best results in the borough of Barking and Dagenham and we pride ourselves on our outstanding teaching, varied programme of enrichment, envious facilities, and exceptional UCAS programme. We offer a wide ranging curriculum that allows students to progress to a variety of future pathways, with a high percentage of our cohort progressing to Russell Group and Top Third universities. We consistently engage with leading organisations and businesses to provide the best aspirational opportunities during A Level study. We have state of the art facilities that allow learners to reach their full potential which include but are not limited to; a private Sixth Form common room, kitchen and study area. We provide all our learners with their required core text books per subject and are happy to support any supplementary or wider reading from our extensive resources bank. We are confident that our students will continue to reach and exceed our high expectations, and we are excited by the prospect of helping you with your next steps towards fulfilling your academic career.